The Newest Rant: The Saint Louis County Library Agreed with my Suggestion That They Ought to Buy a, "Black Lightning," Comic Collection! The Saint Louis County Library Agreed with my Suggestion That They Ought to Buy a, "Black Lightning," Comic Collection! I often write about my fondness for my local library. Well, the other day I was talking with an employee about some comics I thought they should carry and she told me how on the Saint Louis County Library website you can, "Suggest a purchase." I went to the site and sure enough there was a link to do just that. I filled-out a form with the title of the comic, the creators, the ISBN, and my thoughts on why it should be added to the system. I suggested the library buy, "Black Lightning: Cold Dead Hands," as with the success of the television show (which the library did have copies of season 1 available to check-out) it made sense people would want to read stories about the character. 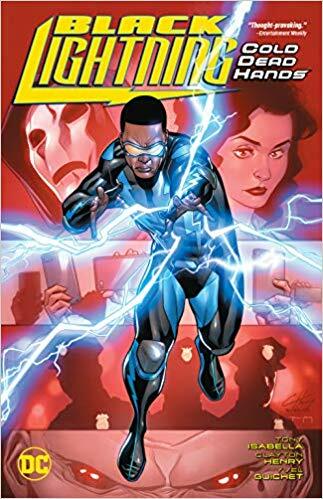 I figured that a recent mini-series written by one Black Lightning's co-creators (Tony Isabella) that was accessible to readers new to the character could make a great addition to the library system. I submitted my proposal a few days ago and quite quickly heard-back from the library that they agreed with me! They will be buying copies of, "Black Lightning: Cold Dead Hands," so that more people can be introduced to the character of Black Lightning! I just want to thank Tony Isabella and Trevor Von Eeden for creating this awesome character and now I don't have to loan people my copy of the book so that they can enjoy it, I can just tell them to visit the library, and then if they like what they read to buy more works by Isabella and Eeden! Thanks. But neither Trevor nor I consider him a co-creator of Black Lightning. He was the first artist and the primary designer of the original costume. The official credit line is "Created by Tony Isabella with Trevor von Eeden." I wrote the line and it was accepted all around. "With" is deliberately ambiguous, but it recognizes Trevor's work on the original series. Thanks.